I returned to Labrador for BERU. Thanks to the gracious hospitality of Nazaire VO2NS and the members of the Hams of Western Labrador (HOWL), I was able to borrow the HOWL club station, VO2WL. I brought my own rig and used my own call sign, but used VO2WL’s amplifier and antennas. I found conditions on all bands very good. 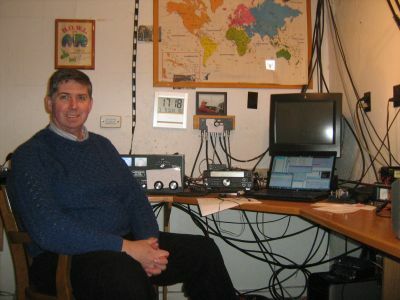 I was most impressed by excellent long path propagation on 20m into New Zealand and Australia, good openings to India, exciting multi-band QSOs with 5X1XA, 9J2BO and 9X0NH, and a very happy single QSO with John 9M6XRO, who I had the pleasure of meeting when I was in Sabah for BERU in 2011. I had numerous five-band QSOs with many stations, but I was not one of the lucky few to work Nigel ZF2XF on 80m before he lost his antenna. Western Labrador has a hard, cold winters, and 2014 was one of the coldest in many years. Temperatures ranged from -15c to -25c during my short visit. That’s not very spring-like. To those of you operating from more agreeable climes, spare a thought for the loonies like me who went deeper into the polar vortex. The VO2WL club station is located in Labrador City on the western shore of Wabush Lake. Just a few steps from the station there are many densely-packed row houses. On the opposite side of the lake is Labrador City’s sister town, Wabush. Lab City and Wabush, are mining towns. Between the nearby houses and the mining operations, the electrical noise levels can be irritating, normally s7 on 80m. The DSP noise reduction in the TS-590 helps a lot, but it is not a miracle cure. The antennas at the VO2WL are fairly good: a 15-metre tall tower supports a two-element 40m yagi and a TH7 yagi for 20, 15 and 10m just above it. The tower also supports an 80m quarter-wave sloper, plus dipoles for the WARC bands and 160m. There is a small second tower which supports a three-element yagi for 6m. I would like to improve HOWL’s antenna for 80m. A sloper is a good antenna for 80m, but a proper vertical and radials would probably be much better. 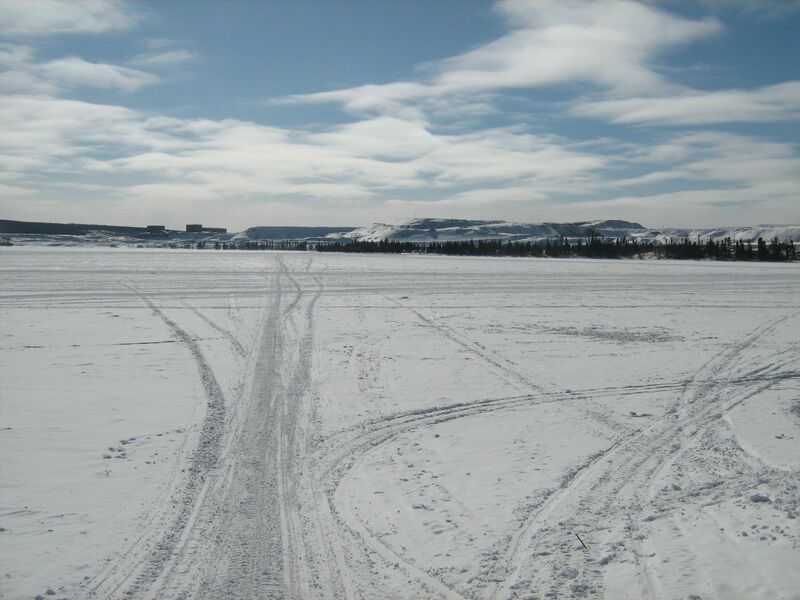 The problem is that with all the snowmobile traffic immediately around the station – Wabush Lake is a virtual snowmobile highway – I’m sure I would injure some unsuspecting snowmobiler, and bring the club some troubles it does not need. 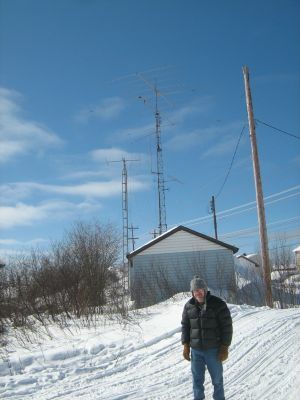 It’s also hard to do much antenna work when the temperatures are around -20c and the snowbanks are two metres deep. SO2R would be very hard to implement at VO2WL, but if I return in 2015, that may have to be a priority. BERU has long been my favourite contest, and this contest was a great joy. I am very happy that I was able to activate an otherwise very hard-to-work call area, and to give those who needed it Zone 2 on a new band. My score increased over last year, thanks largely to the improved propagation. I fell just short of 1,000 QSOs and 10,000 points this time. I also took greater pains to make sure I copied all exchanges correctly, as RSGB’s log-checkers pointed out lots of sloppiness in my entry last year. I am very grateful to Naz VO2NS and his wife Carolyn. They allowed me to stay in their home, fed me, entertained me and provided essential support for my little BERU expedition. They were wonderful, supportive hosts.